Arab Bank headquartered in Amman, Jordan is the largest global Arab banking network with over 600 branches spanning five continents. Arab Bank is also present in key financial markets and centers such as London, Dubai, Singapore, Geneva, Paris, Frankfurt, Sydney and Bahrain. 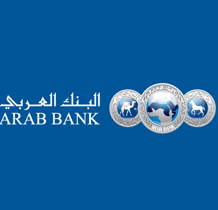 Arab Bank provides a wide range of financial products and services for individuals, corporations and other financial institutions. The Bank’s products and services cover Consumer Banking, Corporate and Institutional Banking and Treasury services.